With its VEN SPRAY PERFECT Venjakob has the innovative answer to all requirements encountered on the market. Based on decades of know-how in the realization of high-performance spray painting plants, it is the flexibility of this new generation that convinces. In the long term, the modular system takes into account all production requirements. At the time of machine purchase, its concept realizes all variants, from one off batch size through to large series production in the high-end range. The modular concept permits implementation of changing framework conditions at any point in time by retrofitting new modules, thereby making your investment future-proof. The sophisticated spray gun control minimizes the rate of overspray. With the patented V-belt design up to 98 % of the liquid overspray can be reclaimed. The paint retrieved in this way is recycled into the paint process. Over and above, the innovative ventilation system improves the ecological energy balance. The short setup times, long service life of the filter elements, fast changing times for spray systems and automated paint-change procedures offer a very high degree of efficiency. 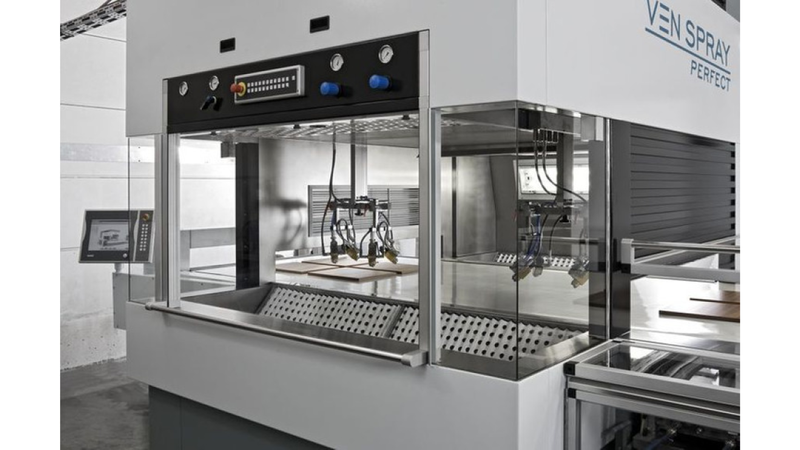 The twin cleaning units allow the use of solvent-based paints as primer and the direct switchover in split seconds to the second cleaner operating with water-based paints. Maintenance and cleaning operations take place completely separate from the production process.